The concentration of radiocesium (137Cs) primarily derived from the Fukushima accident in March 2011 was measured in litterfall of four broad leaf trees (Prunus x Yedoensis cv. Somei-Yoshino, Cinnamomum camphora, Acer buergerianum, and Aesculus hippocastanum) to see whether a typical reduction would occur during defoliation as with its biologically essential analogue, potassium (K). The sampling was performed every two to four weeks between 2011 and 2014, using a trap to prevent contact with the ground. Results indicated that the concentrations of 137Cs basically decreased over time in each defoliation season, although a small derangement could be seen. On the other hand, the concentrations of K in litterfall (except for Somei-Yoshino) once increased at the mid-season and then decreased. As a result, although the K concentrations in litterfall collected last were less than that collected earlier in the season, the seasonal changes in K and 137Cs were not synchronized except for Somei-Yoshino. It is possible that an unknown species-specific K regulationbased time-lag and/or irregularity could influence the synchrony between 137Cs and K transportation, although the seasonal reduction in 137Cs concentration would typically occurred as part of the physiological demand for K.
Trees can be divided into two classes according to their leaf longevity: deciduous and evergreen. Leaf longevity is an adaptive and/evolutionary strategy that enables species to survive in a range of different environments. When faced with drought or cold stress, for example, deciduous species shed their leaves to minimize the detrimental effects. In contrast, by retaining their leaves with much advanced tolerance against stresses, evergreen species expend less energy in developing new leaves. However, all trees eventually shed their leaves. This is a necessary and constructive step in the life cycle of trees, which is required for the renewal of senescent parts, optimization of the spatial arrangement of leaves, and as a competitive measure against neighboring individuals . Prior to shedding their leaves, trees typically translocate nutrients from senescent leaves to the tree body for recycling [2,3]. It is known that translocation efficiency (=resorption efficiency; a specific elemental concentration in green foliar parts [A] minus that in litterfall [B] is divided by [A]) is dependent on both the type of element and tree species. In this regard, compared resorption efficiencies for nine essential elements (N, P, K, S, Mg, Ca, Cu, Fe, and Mn) among four tree species (Birch, Ash, Oak, and Lime) grown in the same soil and under the same climate conditions . Among the findings of this study were the following: the highest resorption efficiency in Birch was for N (more than 70%), whereas the lowest was for Ca and Mg (<5%); Lime trees have 10% to 20% higher resorption efficiency for P and K than the other species, while Ash trees have 15% to 40% lower efficiency for N and S than the other species. In addition to these basic differences according to element and tree species, certain other factors, such as soil fertility, leaf nutrient status, annual precipitation, time span of senescence, and summer temperature, have been reported to influence nutrient resorption [5,6]. Non-essential elements also accumulate/recycle in trees at certain ratios. These non-essential elements can enter trees incidentally via the same uptake/translocation systems as essential elements . For example, Cd is easily translocated from the soil to any part of a tree via the various uptake pathways of Fe2+, Zn2+, and other essential cations. Thus, uptake/translocation of non-essential elements is probably dependent upon soil conditions, particularly in relation to the abundance of related essential elements, and tree species. In other words, whenever considering non-essential elements, it is necessary to know the status of related essential elements. In this regard, although to date the relationships between Cd and divalent metal ions have been particularly well documented from ecological to molecular levels, there is still limited knowledge on the relationships of other non-essential elements . With respect to such incidental uptake/translocation, the status of harmful elements, such as Cd, Hg, As, Se, and Pb, is particularly important for our lives and forest ecosystems, because of their possible detrimental impacts and/ or frequency of contamination [8,9]. In addition to the influences of these conventional elements, there have been growing concerns about the fate of radionuclides in forests following the accident at the Fukushima Dai-ichi nuclear power plant in March 2011 . Radiocesium (134Cs and 137Cs) contamination is of particular concern, because of the comparatively longer physical half-lives of these radionuclides (more than 2 and 30 y, respectively) and their abundance in the Fukushima fallout . Furthermore, forests are known to be effective interceptors of radionuclides compared with other land-use areas [12,13]. However, with the exception of those in the vicinities of residential areas, forests have unfortunately been excluded from the governmental decontamination plan for economic reasons . Because Cs is a non-essential element, when assessing the fate of radiocesium in forests, it is necessary to take into consideration its relationship with essential elements. As a biological analogue of Cs, the metabolism of K in trees is most closely related to that of Cs . Accordingly, sufficient K fertilization can decrease radiocesium accumulation in trees, whereas K deficiency may increase accumulation . In forest ecosystems, forest soils basically tend to be K deficient, although the K level varies widely with seasons and/or individuals . This may emphasize the importance of K recycling, which should affect the status of radiocesium. Indeed, we have demonstrated a strong correlation between radiocesium and K and a possible synchronized resorption in Japanese flowering cherry during leaf senescence . In contrast, litterfall of Japanese cedar showed little correlation between radiocesium and K (Yoshihara et al, although a strict correlation could be seen in age-classified green leaves . This may reflect the prolonged leaf longevity of Japanese cedar and the related physiology, and thus, that the fate of radiocesium in the environment is highly dependent on the leaf ecology of each tree species. Further understanding of this relationship (e.g., in terms of species specificity and effect of environmental conditions) would not only be important for demonstrating accumulation and cycling of a specific element in a forest ecosystem from an ecological perspective, but would also be indispensable for assessing the potential impact on human health, and for establishing countermeasures. This paper demonstrates the results from one such trial to elucidate species specific correlation between K and radiocesium in some tree species (i.e., Flowering cherry, Camphor tree, Horse chestnut, and Trident maple) during their leaf senescence. These trees are popular broad leaf woody species in Japan. Horse chestnut, Flowering cherry, and trident maple are deciduous but Camphor is a kind of ever green. A comparative study among these, and previous results from flowering cherry and Japanese cedar should provide us a good recognition of the fate of radiocesium in trees [18,19]. The sampling targets were four broad leaf trees, some of the most popular ornamental woody species in Japan (Prunus x yedoensis cv. Somei-Yoshino (Flowering cherry), Cinnamomum camphora (Camphor), Aesculus hippocastanum (Horse chestnut), and Acer buergerianum [Trident maple]). These trees stood alone or as a part of colonnades and grew on bare ground at our laboratory in Abiko, Chiba (Laboratory of Environmental Science, CRIEPI; [17,19,20] (Figure 1). Abiko has a moderate monsoon climate (the average of 2011 and 2014 total annual rainfall and annual daily temperature were 1419.8 mm and 14.4°C, respectively; Japan meteorological agency, http://www.jma.go.jp/jma/menu/report.html). The basal soil type was pale Ando soil overlaid with a thin organic layer . Litterfall, consisting primarily of fallen leaves, was sampled between 5 September 2011 and 28 April 2014 (Figure 2). It is noteworthy that some data of Flowering cherry (i.e., 2011 and 2012) was obtained from that presented in . Basically, four to eight samplings were conducted during each defoliation season (at two-week intervals), although the interval was sometimes extended up to three months, depending on the sample volume. Independent samples from at least two to five stands were collected and independently measured with respect to the concentrations of radiocesium and potassium, as shown below. Two box-type traps (each 1 × 1 × 1 m3) were randomly set for each stand to collect litterfall before the litter could contact the ground, and litterfall collected with two traps at the same time from the same stand were mixed together and treated as one sample (Table 1). Every sample was dried for more than 3 days in an oven at 65°C, weighed, and then kept in the oven until further analyses were performed. Figure 1: Schematic description of the experimental site A. Location of the study site relative to the Fukushima Daiichi nuclear power plant; B. Distributions of the target stands within the study site. Figure 2: Meteorological data in Abiko between 2011 and 2014. Annual changes in the monthly average of air temperatures and monthly integrated 455 precipitation in Abiko are indicated for the observation period of 2011 to 2014. 1. Number of observed stands (A) are basically equal to the number of replication (n) for each averaged data in the following figures. Two box-type traps were set for each stand to collect litterfall, and litterfall collected with two traps at the same time from the same stand were mixed together and treated as one sample.2. Total sampling times per defoliation season (B) were shown by each stand.It is noteworthy that the defoliation season of Camphor is extending over year, thus the numbers are indicated between 2012 and 2013 or 2013 and 2014, respectively.3. Total samples per species were shown by each of (A)Q(B). Table 1: A list of the observed plant species. Each sample was weighed, homogenized, and packed in containers (U-8 container, 56 mm diameter × 68 mm height, Asone Co. Ltd., Osaka, Japan) for radioactivity measurement . A Ge-semiconductor detector (GEM20-70, ORTEC, Oak Ridge, TN: The detection limit for 50000 s is about 0.001 Bq g-DW-1), coupled with a mulch channel analyzer (MCA7600, SEIKO EG&G, Tokyo, Japan), was used to evaluate 137Cs activity in the samples. For samples in which radiocesium was undetectable with the 3600s measurement, another 30000s measurement was conducted. Radiocesium activities were rounded off to ten digit or less following the correction of physical decay to the date of assumed fallout . After the nuclide analysis, a 0.5 g aliquot of each dried sample was wet-ashed with a solution of HNO3 and H2O2 for two nights at 110°C and dissolved in 15 ml of 1 N HCl. Elemental concentrations were measured using inductively coupled plasma atomic emission spectrometry (ICP-OES; Optima 5300DV, Perkin-Elmer, Waltham, MA) at wavelengths of 766.490 (K) nm. To compare the differences among each mass of data, two factors ANOVA, Dunnett’s multiple comparison test, and linear regression analysis was performed with an add-on software package for Microsoft Excel, Excel-statistics (ver. 7.0; Social Survey Research Information Co., Ltd., Tokyo, Japan) and/ or Origin (ver. 8.1J SR3; OriginLab Co., MA, USA). In addition, tests of equality between sets of slopes and intercepts in two linear regressions were performed to evaluate the significance of differences in correlations between 137Cs and K concentrations . The result of ANOVA indicated that the effect of a year-to-year variation (i.e., 2011, 2012/2012−13 and 2013/2013-2014 defoliation seasons) was significant (p ≤ 0.001; Table 2) on 137Cs concentrations in litterfall, although the effect of plant species and the combination of these factors were not significant (p ≥ 0.05; (Table 2). Although these results were based on litterfall samples, it is interesting that these corresponded to the previous report for 137Cs concentrations in current year green leaves (i.e., leaves still living on tree) between 2012 and 2013 in some broad-leaf tree species . On the other hand, it is commonly noted in the Fukushima accident studies that the radiocesium concentration in evergreen species is higher than in Deciduous species and the annual rate of decrease during the early phase of fallout (i.e., usually around two years) is larger in evergreen species than in deciduous tree species [20,25-28]. These are generally explained by a difference in the ecological characteristics of trees; particularly, whether their foliage was expanded at the time of the fallout and directly received radiocesium deposition. In this regards, Camphor tree has broad leaves but is a kind of evergreen species, and ordinarily grows leaves in cycles of more than one year . Thus, unlike other evergreen species, the litterfall of Camphor tree seemed to be already outside of the interval of influence from direct deposition, as shown in ordinary deciduous species at least in the 2012-2013 defoliation season. Table 2: Two factors ANOVA to determine the effects of plant species and defoliation seasons on 137Cs and K concentrations in litterfalls. The 137Cs concentration in litterfall basically exhibited a time-dependent decrease in every observed species (Figure 3). In fact, the reductions in the concentration from the beginning to the end of each defoliation season were 250-530 Bq kg-DW-1, 190-650 Bq kg-DW-1, 350−1270 Bq kg-DW-1, and 90-680 Bq kg-DW-1 in Flowering cherry, Camphor tree, Horse chestnut, and Trident maple, respectively. In particular, the reduction in Flowering cherry was significant in every observed season from 2011 to 2013 (Figure 3A). Thus, the previous reports for an autumnal decrease of 137Cs concentration in cherry litterfall was clearly ascertained in both the following seasons and expanded numbers of species . It is noteworthy that the duration of decrease was prolonged and the timing was deviated in evergreen Camphor trees than those of the other observed species, although the 137Cs concentrations decreased at the end of each defoliation season (Figure 3B). Such disparities may reflect the leaf longevity and defoliation timing of Camphor tree. However, in case of another evergreen species, Japanese cedar showed no specific seasonal decrease in the 137Cs concentration in litterfall . It is possible that extended leaf longevity of the other evergreen species than Camphor tree related to this non-specific seasonal decrease in litterfall (Figure 3C). Otherwise, this might be related to a morphological and/or physiological difference between conical and broad-leaf species. On the other hand, the possibility cannot be ruled that a late starting time for the sampling (i.e., late September) in 2012 could have induced apparent insignificance for the decrease in every species except Flowering cherry. In addition, a few irregular changes in the 137Cs concentrations were observed in the middle of the defoliation season, particularly in Trident maple (Figure 3D). Some factors independent of tree physiology, such as accidental incorporation of higher radiocesium containing tissues (e.g., bark) in samples, or strict fixation of radiocesium in specific tissues, could relate to the irregular changes. Otherwise, it is possible that a temporal derangement in physiological orders related to this phenomenon. Nevertheless, it is probable that the seasonal decrease of 137Cs concentration in litterfall would be a common phenomenon, at least among observed tree species. If the seasonal decrease of 137Cs concentration in litterfall could be considered a physiological matter, the mechanism should be shared with other elements, which are essential for plant growth, and which behave as biological analogues of Cs. As one such possible mechanism of the seasonal change in 137Cs concentration, the changes in K concentrations is discussed in the following section. Figure 3: Transitions of radiocesium concentration in litterfall of four broad-leaf tree Species. The means and standard deviations of 137Cs activity concentration (kBq kg-DW-1) in individual samples (n=2 to 5, Table 1) are shown by sampling season: A, Flowering Cherry; B, Camphor tree; C, Horse Chestnut; and D, Trident Maple. The137Cs activity concentration is displayed after adjustment for the date of assumed deposition (21 March 2011). The horizontal axis is indicating the elapsed time after the assumed deposition (days) with year and initial of corresponding month in upper space. Asterisks on the standard deviations indicate significant differences (p ≤ 0.05) between data of the first sampling in each defoliation season and later ones, using Dunnett’s multiple comparison tests. Data for Camphor tree are not provided for the statistical analysis because replication was insufficient. The data from 2011 and 2012 for flowering cherry was obtained from that presented in Yoshihara et al. The result of ANOVA indicated that the effect of plant species was significant (p ≤ 0.001; (Table 2) on K concentrations in litterfall, but the effect of a year-to-year variation and the combination of these factors were not significant (p ≥ 0.05; (Table 2). A species specific and year-to-year variation in K concentration of foliar parts is a commonly observed phenomenon [16,30,31]. 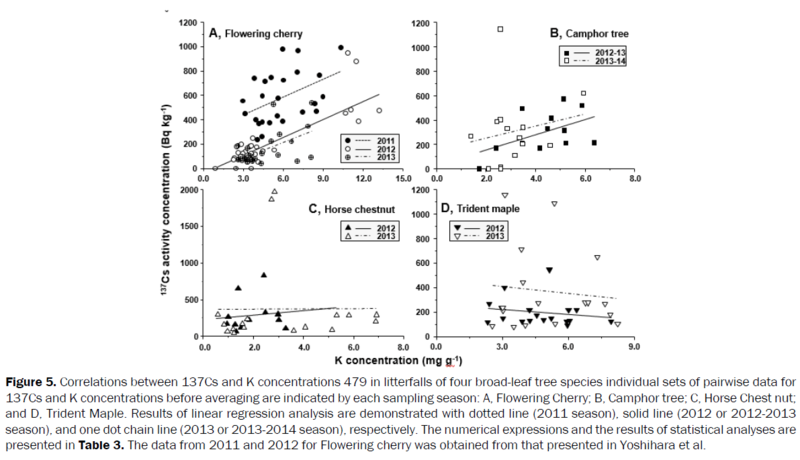 On the other hand, Flowering cherry demonstrated a clear time-dependent decrease in the K concentration in every season from 2011 to 2013 (Figure 4). Such a seasonal decrease of K concentration in litterfall is also well-known [2,3,32-34]. A decrease of K in living leaves is paralleled by that in freshly fallen leaf litter and time-dependent increases in nutrient resorption efficiency  (Niinemets a). Although two factors in tree physiology, resorption and leaching, could be a major cause of the nutrient decrease, recent observations concluded that resorption accounts for larger contribution than does leaching [4,36,37]. The resorption efficiency varies by element, plant species, and nutritional/soil conditions. The resorption ratio of K is usually between 30% and 90% [4,34,35,38,39]. Figure 4: Transitions of potassium concentration in litterfall of four broad-leaf tree species. The means and standard deviations of K concentration (mg g-DW-1) in individual sampling (n=2 to 5, Table 1) are shown by sampling season: A, Flowering Cherry; B, Camphor tree; C, Horse Chestnut; and D, Trident Maple. Asterisks on the standard deviations indicate significant differences (p ≤ 0.05) between data of the first sampling 475 in each defoliation season and later ones, using Dunnett’s multiple comparison tests. Data for Camphor tree are not provided for the statistical analysis because replication was insufficient. The data from 2011 and 2012 for Flowering cherry was obtained from that presented in Yoshihara et al. In contrast to the typical time-dependent decrease shown in Flowering cherry, the seasonal decrease in litterfall recognized in Camphor tree, Horse chestnut, and Trident maple was distinct (Figure 3B-3D). That is, in these species, the K concentrations showed the highest values at the mid-point of each defoliation season (i.e., “a mid-season increase”), although the lowest values were shown at the end (except for Camphor tree in 2012-2013). The amount of reductions in the concentration from the beginning to the end of each defoliation season were -0.96 to 0.32 mg g-DW-1, 0.59-2.24 mg g-DW-1, and 0.75-1.99 mg g-DW-1 in Camphor tree, Horse chestnut, and Trident maple, respectively (Figures 3B-3D). These reductions were considerably less than in Flowering cherry (3.21 to 9.07 mg g-DW-1; (Figure 4). Such a “mid-season increase” in the K concentration in litterfall can be seen in some other species, such as pine, oak, hickory, and mesophytic hard woods . In this regard, observed a time-dependent decrease in K content of freshly fallen leaf litter in most, but not in all species . They hypothesized that time dependence could arise if the leaves that had been shed at different times, had also entered senescence at different times, but had undergone resorption simultaneously, might result in equal nutrient withdrawal from the leaves. Conversely, leaves that had not kept the pace of resorption that others had, would not show the time-dependent decrease. In addition to such luck of coordination in related physiological processes (i.e., shedding, senescence, and resorption), another hypothesis, such as reflux and/or overflow of once resorbed elements from the sink, cannot be eliminated from attempts to explain the “mid-season increase”. To see a specific correlation between the 137Cs and K concentrations, individual sets of pairwise data before averaging were provided for linear regression analysis. Results indicated that a significant correlation between 137Cs and K concentration was demonstrated in Flowering cherry in every year observed (Figure 5 and Table 3). The Pearson’s r of each regression line in 2011, 2012, and 2013 were 0.45 (p=0.025), 0.83 (p ≤ 0.001), and 0.56 (p ≤ 0.01), respectively. Thus, the time dependent decrease in the 137Cs concentration was highly correlated with that of the K concentration in Flowering cherry (i.e., high synchrony), and this correlation was correspondent to that in previous reports . It is very interesting that the similarity in regression slopes also remained through these years (i.e., 49, 49, and 44 in 2011, 2012, and 2013, respectively; p ≥ 0.05). However, the regression intercepts were similar between 2012 and 2013 (p ≥ 0.05), but different between 2011 and the others (p ≤ 0.05). This could be due to reduction of the 137Cs concentration within 2011 by an environmental cause, probably the so-called weathering effect. However, this effect disappeared after 2012; so not much difference was seen in the 137Cs concentrations in 2012 and 2013. 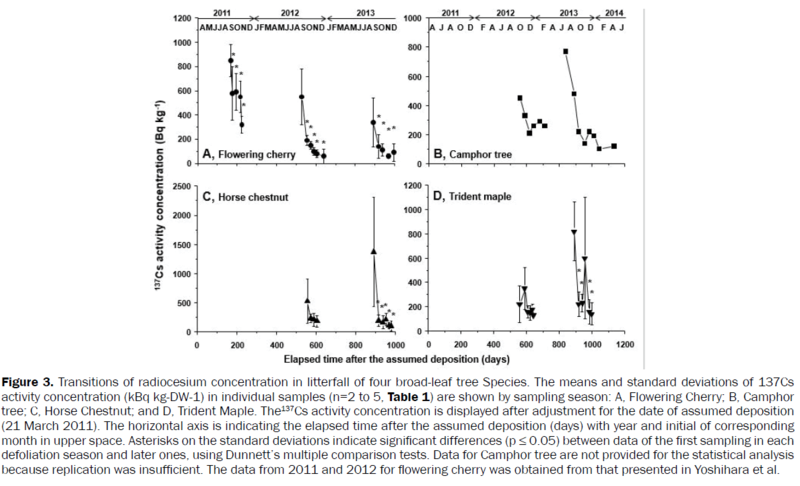 Figure 5: Correlations between 137Cs and K concentrations 479 in litterfalls of four broad-leaf tree species individual sets of pairwise data for 137Cs and K concentrations before averaging are indicated by each sampling season: A, Flowering Cherry; B, Camphor tree; C, Horse Chest nut; and D, Trident Maple. Results of linear regression analysis are demonstrated with dotted line (2011 season), solid line (2012 or 2012-2013 season), and one dot chain line (2013 or 2013-2014 season), respectively. The numerical expressions and the results of statistical analyses are presented in Table 3. The data from 2011 and 2012 for Flowering cherry was obtained from that presented in Yoshihara et al. 1. Individual sets of pairwise data for 137Cs and K concentrations before averaging, which shown in Figure 4, are provided for each linear regression analysis in each defoliation season.*2. Results indicate that only Japanese flowering cherry exerted significant positive higher correlations between 137Cs and K concentrations.*3. The data of 2011 and 2012 for Flowering cherry was obtained from that presented in Yoshihara et al. Table 3: Linear regression analysis of the correlations between 137Cs and K concentrations in litterfalls. In contrast to the case of Flowering cherry, no significant correlation between 137Cs and K concentration could be observed in Camphor tree, Horse chestnut, and Trident maple (Figure 5 and Table 3). The Pearson’s r of each regression line was up to 0.51 (p=0.093) in the 2012-2013 season for camphor tree, and some values were almost zero (e.g., r=0.002, p=0.99; in 2013 in Horse chestnut) or minus (e.g., r= -0.19, p=0.60; in 2012 in Trident maple). Similar values in the regression intercept were obtained for each species (Table 3). Similarly non-significant correlation between 137Cs and K concentration could also be seen in preceding observations. For example, Antonopoulos-Domis et al. Demonstrated that 40K concentrations in green leaves of apricot trees showed time-dependent decrease during the growing seasons [40,41]. whereas the 137Cs concentration was maintained at its initial value throughout the season [42-44]. However, in the present case, a time-dependent decrease in the 137Cs concentration was more or less indicated in every observed species, but a decrease in the K concentration was differently indicated after the “mid-season increase”. In addition, although the time of appearance was different, a similar “mid-season increase” could be seen not only in the K concentration but also in the 137Cs concentration in Trident maple. Together all, it is hypothesized that a basic mechanism to resorb 137Cs and K was at work, but that an unknown factor or factors with particular effect on K, could have influenced the correlation and disrupted the synchrony. As mentioned in the previous section, the results could be due to lack of coordination in related physiological processes (i.e., shedding, senescence, and resorption), or due to participation of another mechanism, such as reflux and/or overflow of once resorbed elements from the sink. In conclusion, a time-dependent seasonal decrease was observed both in the concentrations of 137Cs and K, and sometimes, a specific correlation could be seen between these concentrations; however, this phenomenon would be dependent on species and highly variable by a specific condition. The mechanism inducing such variability was still unclear. Further evidence and analysis will be necessary to understand the phenomenon [45-47]. We thank Mr. Hiroshi Shimura, Ms. Mari Sato, and Ms. Miki Ueda (Co. Ltd. Ceres), Mr. Yukihiro Taemi, and Mr. Keita Yamaguchi (Co. Ltd. Denryoku Tech. Sys.) for their skillful assistance in sampling and analysis of radionuclides. This research was supported in part by a Grant-in-aid for Scientific Research from the Japan Society for the Promotion of Science (JSPS, 15H04621).